Segregated medical treatment for Indian patients was the norm in community hospitals where they were treated in the basement or 'Indian annexes' but the outbreak of tuberculosis (TB) introduced segregation on a larger scale. It is important to understand the symbiotic connection between the high incidence of TB in Indians and residential schools. Many of the residential schools, with the overcrowding, malnutrition, and lack of heat were fertile sites for the rampant spread of the highly communicable tuberculosis virus. Children who became infected were sent to the Indian hospitals, and when they showed signs of recovery, were sent back to the residential school. This mutually beneficial arrangement maintained the numbers and funding of both organizations. Just as it was legal, under the Indian Act, to apprehend Indian children and put them in segregated (residential) schools it was legal to apprehend Indians suspected of having TB and quarantine them. Interestingly, that part of the Act remains today. In some centres, the local doctor was also the Indian agent. There also were examples of experimental treatment of tuberculosis. Records were poorly kept but some patients speak of having a lung removed which involved having sections of their ribs connecting to their spines cut off - an operation routinely performed with just a local anesthetic. As ribs don’t regenerate, those who suffered through and survived these operations were left crippled, both physically and emotionally. One of the founding principles supporting the establishment of hospitals for the sole treatment of Indians was that they would be run cost efficiently. That underlying principle led to the majority of staff being poorly trained health care workers. Doctors were not interested in working in remote, isolated, poorly funded, inadequate Indian hospitals when they could work in major centres. 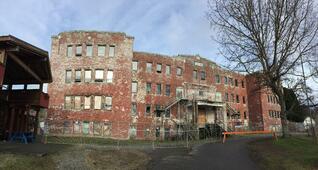 The buildings were often redundant military barracks haphazardly repurposed as hospitals. These buildings generally lacked the most basic features of hospital facilities of the era and were run with inadequate laundries, inadequate kitchens and poor maintenance - inadequacies that exacerbated the symptoms of the patients. This article just touches on some of the many aspects of Indian hospitals. It is an expansive topic that deserves much more exploration and exposure. We will be compiling a reading and listening list for those of you who are interested in expanding some of the aspects of Indian hospitals touched on here. In this free ebook we dispel nine pervasive myths regarding Indigenous Peoples. Click the book cover icon to begin your download.